Buying a new hair dryer might seem like an easy task and you might not usually put much thought into which one you buy. They all do the same thing right? …..well pretty much yes but blow drying your hair correctly or efficiently is the difference between a great blow dry that lasts for a couple of days or a blow dry that lasts the day. As a hairdresser we spend a lot of time perfecting the art of blow drying hair so it last as long as possible. I’m also from the era when most ladies visited the salon on a weekly basis to have their hair professionally styled so it lasted a week…..yep a whole week! times have moved on since then what with the aid of heated styling tools and lifestyle changes that’s fast becoming a thing of the past. 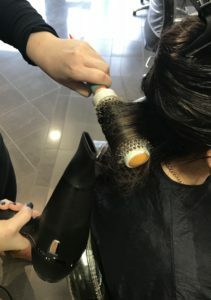 However at Caprio’s we pride ourselves on blow drying your hair properly, not just blasting it dry and doing the rest with straightners, anybody can do that! We currently use ghd ‘Air’ Dryers in the salon and have done for many years now. they very rarely let us down and I mean very rarely. Considering how much use they get I can’t fault them at all. I recently had the opportunity to try the new Dyson hairdryer. I have to say at a whopping £299 my expectations were high. The dryer claims to reduce frizz, reduce the blow drying time, leave the hair shiny and soft, add body and lift to the hair etc etc…. if this dryer reduces the amount of time I spend on my hair in a morning then I’m sold. The particular morning I tried it out I had over slept so thought ‘Great! lets put this dryer through it’s paces’. Usually it takes me a good half an hour to dry my thick naturally wavy hair into a sleek smooth bob. 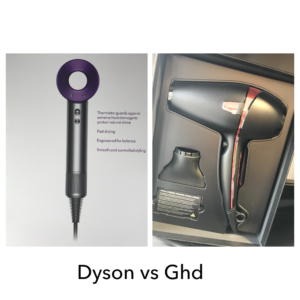 (I use a ghd ‘Air’ dryer at present).When I switched the dryer on it was a slightly quieter motor to my ghd dryer and felt quite powerful however it didn’t reduce my blow dry time,(that last sentence was said in a disappointing tone) my hair was soft…but too soft and fly away and I have to say it was flatter, too flat, throughout the day my hair felt lank. It was shiner but I’m not sure if that was my imagination or not. So on reflection I can’t say I’m that impressed with the Dyson hairdryer. However I did rush my hair , and there is a lot of it so I’m going to give it another go as I really want to like it. I’ll keep you posted on my next experience using it to see if my opinion has changed.